(a) How is the tension T1 in the string attached to the mass M1 related to the tension T2 in the string attached to the mass M2? (b) How is the magnitude of acceleration a1 of the mass M1 related to the magnitude of acceleration a2 of the mass M2? (d) Determine the accelerations a1 and a2 of the masses M1 and M2 respectively. 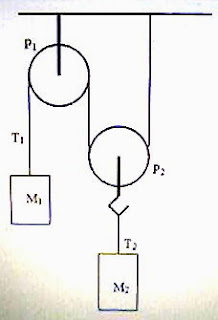 (e) Determine the tensions T1 and T2 in the strings attached to the masses M1 and M2 respectively. Try to answer the above question. I’ll be back soon with a model answer for your benefit. You can access all posts related to Newton’s laws of motion on this site by clicking on the label ‘Newton’s laws’ below this post.